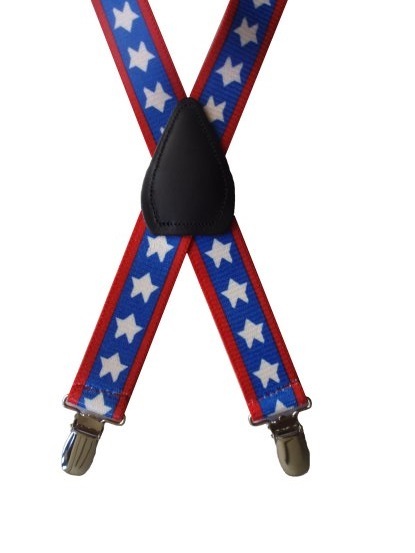 Get ready for summer with red white and blue stars suspenders. This White Stars pattern is festive for parades and celebrations for the 4th of July. Made in the USA. This is a charming Americana pattern. Add to tees and shirts for your little lads patriotic spirit. Good quality elastic and sturdy polished finger clips on the ends of the suspenders. The elastic is 1 inch wide. Ships in 1 day. The Small size generally fits kids age 1 year to age 4 years - the elastic suspenders are adjustable to a maximum length of 25 inches.